A week or so ago, Half Price Books had their big 20% off of everything sale. It's so exciting! My friend Karri and I went and spent a couple hours there (on our opposite sides of the store....haha). I found a good stack of books, then headed to the sewing patterns. Our HPB has this random box of sewing patterns that is just SO FUN to dig thru!! I can't help but sort them, tho, as Karri witnessed. 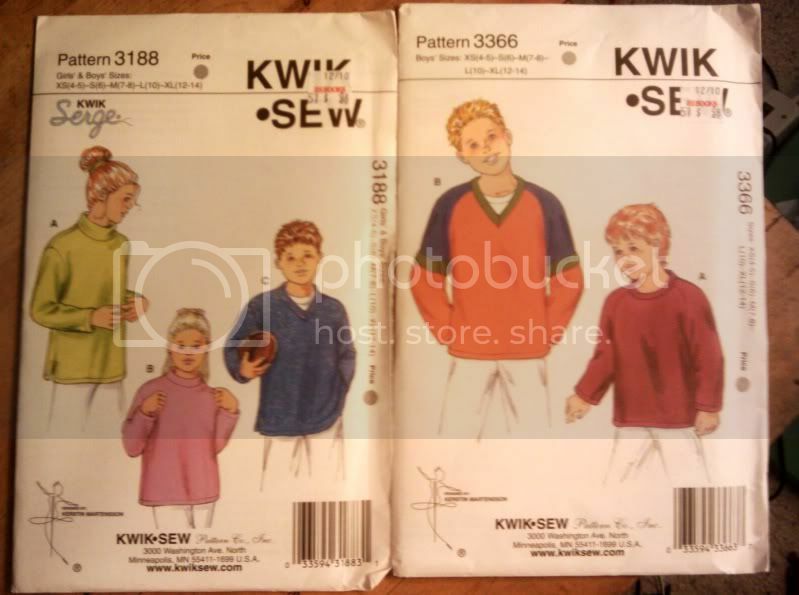 They are always (it seems) arbitrarily priced: a used simplicity from the 80s of dubious style is $2.50, but the stack of Kwik Sew Patterns were $1. Hmmm, well, really .98. Of course, they were 20% off, too. There was a pretty good stack, most of things I wouldn't be able to use: Plus Sized dresses from the early 90s, girls swimwear and coverups, all unused. Not even opened. I found these two, which will get plenty of use around here. Nothing exciting or fashion-forward, but definitely a good buy for practical patterns that will get plenty of use. Even at their "full price" they're a bargain. Because I switch machines around a lot (I have three) and go between my serger and coverstitch machines a lot, I buy my thread in huge spools. A couple of my machines don't have an extra spindle for double-needle stitching, and sometimes I'll want a thread I've only got on a huge spool that won't fit on my machine. So, because of this, I bought this nifty cone thread holder with the 50% coupon at JoAnn. It's very simple, black plastic, and I think ended up costing me $3 or something. I use it ALL.THE.TIME. I LOVE it!! You just set it up sort of close to your machine, but out of your way and probably behind both your coffee and your ginormous pin cushion. 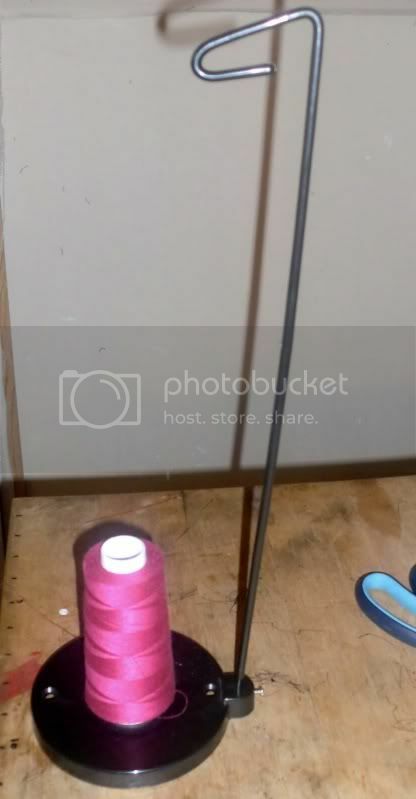 The thread goes up, rests over the hook thing, then threaded onto your machine as usual. Here it is with a normal-sized spool of thread. And then with a regular-sized Maxi-lock cone. It's even large enough for those industrial triple-sized cones! The weight of the cone holds it done, so it's a bit precarious with the small spools and sometimes I'll knock it down when I reach for my coffee, or pause Netflix. Mostly I use it with larger spools but it's great for that extra spool for double or triple needle sewing. 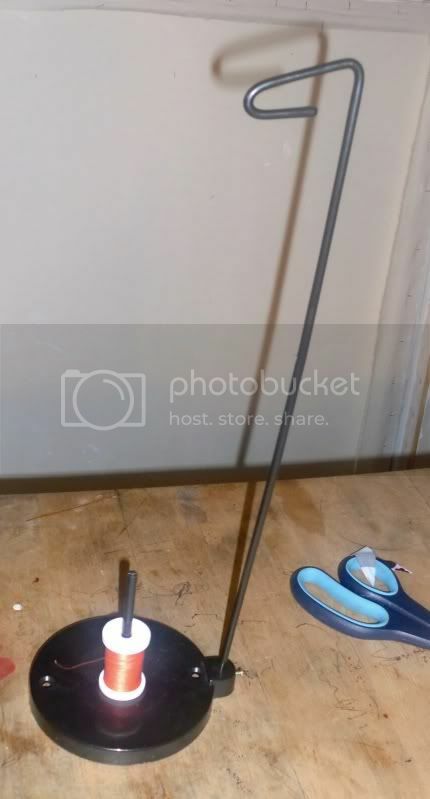 While this seems to stand up to both my abuse and that of my boys who steal it and disassemble it weekly, if you regularly use smaller spools, a metal one might be better. I have one of those thread jobbies too. Though it's my 2nd one. The first one I got from Joann's & it had a plastic base. The one with the plastic base is a total waste of money. I replaced it with one that has the metal base & couldn't be happier. The cone allows me to use serger thread or the big 6000 yard cones of Perma-Core that I use for my longarm quilting machine. Love your blog. I giggle over the boys all the time. I wish I sewed as much as you.